NITI Aayog’s recent report, “Composite Water Management Index”, underscores the looming threat of India’s water crisis. Its current proportions are severe—about 200,000 people die every year due to inadequate access to water—and are set to become far more so. There are many dimensions to the problem. One of the most important is agriculture, given that it consumes about 83% of India’s freshwater resources. In this context, another recent report—the National Bank for Agriculture and Rural Development (Nabard) and Indian Council for Research on International Economic Relations’ (Icrier’s) “Water Productivity Matching Of Major Crops”—holds important lessons. The roots of the problem, ironically enough, may lie in the Green Revolution. By 1961, India’s agricultural yield problem was severe enough to threaten famine. Norman Borlaug, V.S. Banda and their ilk ensured food security with the revolution. But this also included skewed incentive structures—heavily subsidized electricity, water and fertilizers for farmers—which have played a significant role in the misalignment of crop patterns in the country. Consider the production of water-thirsty crops like paddy and sugar cane in the Punjab-Haryana belt and Maharashtra, respectively. There is a serious mismatch between the cropping pattern of these crops and water resource availability in the states growing them. Government incentives, such as the sugar mill build-up pushed by politicians in Marathwada to replicate the prosperity created by mills in other areas, as well as assured markets for these crops through procurement, have led to farmers cultivating these water-guzzling crops, despite the water-scarce nature of these regions. Environmentalists have often argued that sugar cane is the cause of chronic drought in Marathawada. The Nabard-Icrier report also makes an argument for moving such high water-reliant crops to other, relatively water-abundant areas. The Union minister for transport and water resources, Nitin Gadkari, seems to disagree with the feasibility of changing crop patterns to relieve water scarcity. That is politically understandable. Any such disruption will come at a political cost. But it is economically—and, for that matter, existentially—important. 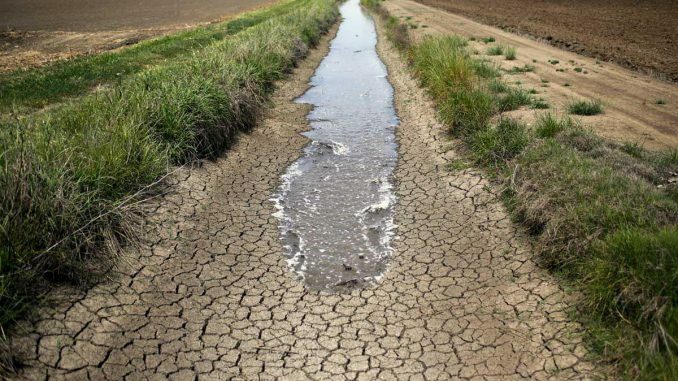 If state policies put a thumb on the scales in the first place, it is incumbent on the government to find the right incentive structure for a sustainable solution to the water crisis. For instance, in regions with high irrigation water productivity better suited to water-intensive crops—such as Jharkhand and Chhattisgarh—poor power supply and other such problems make cultivation of water-intensive crops non-remunerative. There is room for the government to correct such misalignment. A decisive step in this direction would be reapplying the primary lesson of the Green Revolution: Science can help. India’s public sector agriculture research institutions led by the Indian Council of Agricultural Research had released a record 313 new crop varieties during 2016-17. These crops would increase farm production while minimizing the use of inputs. The list of new crops includes an early maturing (52-55 days) variety of mung pulse—the first of its kind in the world. Developments like these have the potential to help states adopt a more sustainable cropping pattern without disrupting the flow of their income streams. And there is room for improvement here when it comes to research and development. India still lags behind its Asian neighbours in agriculture genomics—the process of increasing agricultural productivity by developing crops with promising agronomic traits. Readjusting cropping patterns is a job only half done, however. Investing in readjusting irrigation patterns is equally important for fulfilling the “more crop per drop” objective. Natural water systems lose their dilution capacity on becoming hydrologically deficient, leading to a higher concentration of pollutants. To deal with such water-management challenges in rivers and groundwater, boosting alternative irritation techniques such as drip irrigation is a necessity. There has been some progress here; the Maharashtra government has made drip irrigation mandatory for sugar-cane cultivation, for instance. But more must be done. State agriculture universities have a big role to play here. Consider the work done by scientists from the Tamil Nadu Agricultural University. They have been suggesting irrigation techniques such as the alternate wetting and drying method (AWD)—a widely practised technique in the Philippines and Vietnam—in the wake of the Supreme Court’s Cauvery water-sharing decision. This technique enables farmers to save up to 5,000 litres of water for each kilogram of rice produced—water savings of about 30% without a decline in yields. The tasks of making agriculture remunerative as well as water-friendly eventually coincide. Doubling farm income by 2022 is a tall order. But if the current government and its successor are to hew to the spirit of that promise at the least, research and development in multi-resistant, water-efficient and high-yielding crops along with investment in alternative modes of irrigation are musts.